Feinrich: from the absolute best background. combined with that of probably the most important mare in modern Oldenburg breeding history, El.St. Gesina. 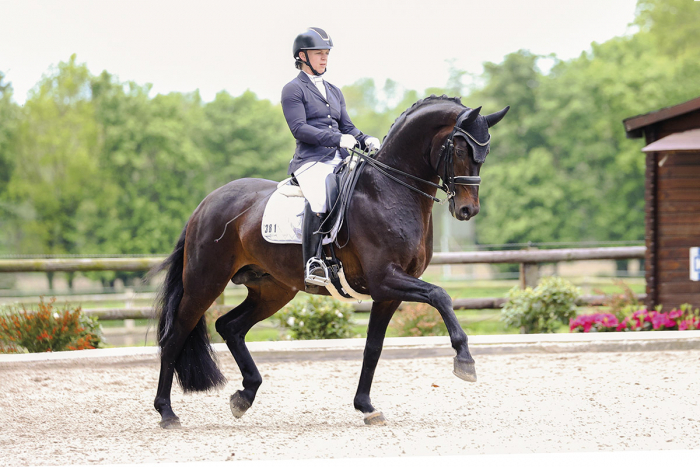 His sire Fürst Heinrich was Champion Stallion in 2001, winner of the main premium in 2002, World Champion of five-year-old dressage horses in 2003, and has produced 53 licensed stallions, including Fürstenball, licensing and main premium champion, German champion and elite sire as well as Fürst Romancier, main premium winner. His dam El.St. Gesina also produced Feinrich’s full sister, Fürstin Gesine, Oldenburg Champion Mare and placed third at the regional championships, as well as For Romance I, Oldenburg Champion Stallion, Main Premium winner and Burg Cup Finalist, his full brother For Romance II OLD, premium stallion who stands at our stud and Fasine OLD (all by Fürst Romancier) Oldenburg Champion Mare, German Champion, P.S.I. price record holder and successful at S level. Fasine OLD is the dam of Fasino (by Foundation), who also stands at our stud. Dante PS comes from the crossing of Gesina and Dante Weltino. From early on, dam sire Sir Donnerhall I was considered as a foundation stallion. Grand dam Gesine also produced the 1st Reserve Champion Vivaldi’s Schufro (by Vivaldi). In the third generation is Don Schufro, Danish Champion and Team bronze winner at the Olympic Games in Hong Kong/HKG in 2008 with Andreas Helgstrand. Feinrich goes back to the dam line of Voltaire. Feinrich is stationed at Deckstation Paul Schockemöhle in Mühlen.